First performance at St. Francis! 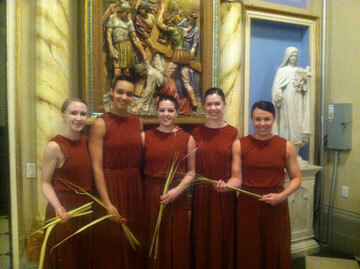 Ballaro Dance performed a beautiful piece at Palm Sunday mass on March 29. It was the first time dancing in the lovely church space where Brothers and Sisters will be performed on Saturday, June 20. The congregation was filled with 287 members of the community and with awe they watched on. The spirit of the dancers filled the huge space with hope, love, and compassion -- a beautiful way to start holy week. Angela, a St. Francis de Sales Cantor, sang "Above All" with power -- it was truly a sight to see. Join us in June for the evening length work!